I never really mention my Ford Raptor in these posts, as it is just there in the background, doing the daily grind, taking the strain and of course lugging around parts from workshop to garage to workshop. To be fair, despite having all these cars and bikes, its often the only one at home or that works! 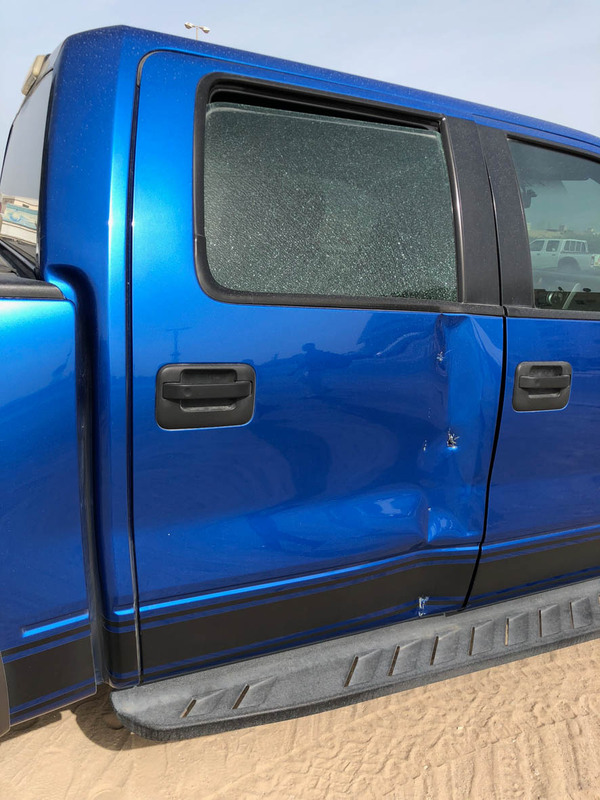 A flatbed truck decided to reverse into it – smashing the rear passenger side door – punching two holes (not dents) in the door and smashing the glass, right next to the child seat my 3 year old was sat in at the time. No great issues, it happens. I’m not that upset with the driver. What I am having a rant about and fighting is the insurance company – accident on the 15th April, only yesterday 25th they confirmed the repair and today they seem to have agreed that I’ve receive AED125/day but only for 3 days from the other insurer for my inconvenience, oh and the car will be ready hopefully towards the end of next week. Previous Previous post: After all the trials and tribulations – the new TVR engine runs.